When I borrowed this movie, I wasn't expecting a high-quality performance, but this was just sad. Most of the acting was so unbelievably bad that you couldn't easily get into this movie if you tried. There's nothing quite like seeing a kid announce things like "Oh no! My Dad is invisible!" or "I wonder what this does?" in the same monotone that one might announce traffic advisories over the radio with. There are some good actors, but they are wasted on smaller parts. The story is decent, though it would be fairly easy to guess, considering that there aren't too many real plot changes. Lots of holes, too. For example, the Dad is invisible, and the inventor figures out what part is needed to make him visible again. So the boy goes and steals the part from an electronics store. Couldn't he just ask his Dad for the cash? 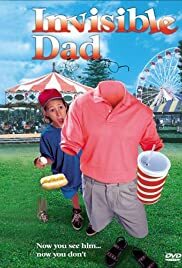 This shows up in the Comedy category, but most of the comedy in this movie was fairly dumb, like the Invisible Dad taking off his clothes while invisible and then almost reappearing naked during a meeting, or walking around with his head covered at all times. Funny at first, but it gets old. 2/5, because it is watchable, and it's one of those movies that are funny in their own way... like the monotone recitation of lines.